No, you didn't miss it – the hosts were just running late this month, which is just fine with me considering that I seem to be late for everything. 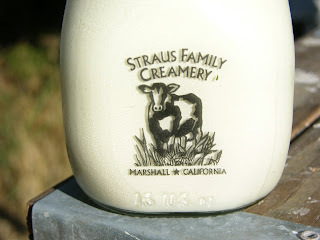 This month's theme, hosted by eGullet, centered around all things dairy and it was a bit of a challenge for me. It's not quite the season to be thinking about creamy drinks like eggnog, and most dairy drinks that come to mind tend to be heavy. I'm not quite brave enough to add cheese into the mix, and egg white just sounded kind of boring. But then I remembered the House-Made Ingredients bar class that I attended during SF Cocktail week at Absinthe (that I never wrote about because I was too lazy). We got a crash course on how to make your own Irish Cream liqueur at home, minus the yucky stabilizers. Now, it has been a while since that class, and my notes were jotted down in the anticipation of being rewritten shortly after the presentation. 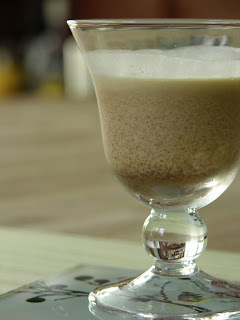 Of course this never happened, so the result of my first try might not have been my ideal version of Irish Cream – but it wasn't a failure either. Below you'll find the adjusted recipe and a list of tips you'll want to read before making it for the first time. 1. In a medium saucepan, steep the ground coffee in the cream/milk mixture on low heat for several minutes, tasting occasionally and stirring constantly. When satisfied with the coffee flavor, add the tea and continue to steep for another 2 minutes. Taste again, and if the desired flavor profile has been reached, remove from heat. 2. Pour the mixture through a fine mesh strainer, let cool, then add the whiskey. Taste the mixture and then begin adding sweetener of choice until the liqueur is to your liking. 3. Filter again, using cheesecloth if you desire a smoother mouth-feel. 4. Pour your homemade Irish Cream in a container and store in the refrigerator for up to two weeks. 1. Do not let the cream get too hot, and definitely don't let it boil. 2. Stir constantly while steeping the mixture. 3. Add the coffee first, then the tea, being careful not to over-steep the tea (it can become bitter very quickly). 4. If you're using a strong tea such as Earl Gray (like I did), be careful that the flavor doesn't overwhelm the mixture. Either lessen the amount, or cut it with a milder black tea. 5. Use fresh, high quality coffee, just as if you were making a cup in the morning. YES! I can't get enough of Baileys or Bushmills but I'm trying to eliminate any sort of carrageenan or other gross stabilizers from my life so I'm gonna try this!